Send Pink Roses Basket to Chennai. Gifts to Chennai. Send Flowers to Chennai. 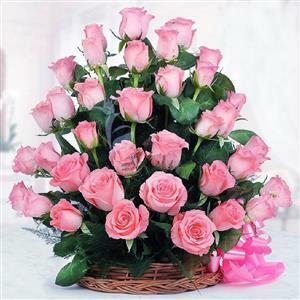 Description : This basket of 50 long stemmed pink roses will be an ideal gift for your loved one on any occasion or festival. Presented in a pink colored basket which has a pink bow at the front, this bunch will certainly bring a smile on the recipient's face. Send this blooming roses basket to Chennai through Gift2Chennai.com and make the moments special forever. You may also send Gifts to Chennai to all your near and dear ones by choosing from our wide collection.